7 Ways To Protect Your Belongings While Staying In A Hotel | Calgary Alarm Inc. When staying in a hotel, there are a variety of threats to your belongings if you don’t take precautionary measures. More serious threats are coming to light. Four million hotel rooms all across the world can be broken into via key card locks manufactured by Onity, for example, which can be opened in a matter of seconds with a homemade device that costs less than $50. Of course, housekeeping staff stealing items is still ever-present as well. Prevention is important. Some signs of a hotel that takes security seriously is one with 24- hour front desk access and a hotel that has safes. If your hotel uses Onity locks, a very common type of lock, it is a good idea to ask if they have implemented the changes used to prevent break-ins. One change is a complete revamp of the locks, which involves replacement of the circuit boards, along with plastic plugs to go over the port on the bottom of the locks. At best, you will have an idea of how seriously they take security. Alternatively, you could bring your own tamper-evidence tape to cover the bottom of the port. Thieves will be unlikely to enter your room if they will leave evidence behind. Increase your level of security by also using the door bolt (or chain) above the lock. Keep windows and doors locked at all times. Do not even leave your door open while you run to get ice down the hall. Also, always inspect that locks are in good working order before you unpack all of your belongings. Although hotel safes are not without their own security flaws, they usually do act as enough of a deterrent that thieves will move on to another room. Ensure that the default password (0000) doesn’t open the safe. 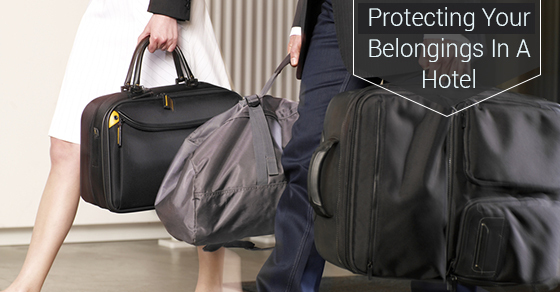 To ensure maximum protection of your valuables, consider leaving them at the front desk. This will give the impression that you are in the room and act as a deterrent against any potential burglars. If you receive a call from the front desk asking for your credit card information, do not give them this information. To avoid becoming a victim of fraud, always provide this information in person. You should always take security seriously, even when you are at home. If you don’t yet have a home security system, it is critical that you get one. Houses without a home security system are three times more likely to be broken into. Consider Calgary Alarms for your choice of alarms – we are one of the best security alarm monitoring companies in Canada. Contact us today for more.